the hesitation of higher cost has been forgotten !" Too many poles, ducts too low. didn't want to - just to hide all the poles and ductwork. This particular home had one of the longest and deepest (almost 14") under-beam duct sections that we had yet come across. duct hump which would have been above a high traffic area of the floor plan. at about eyebrow level for most people ! By reinforcing the existing I-beams to accommodate the longer spans, we were able to eliminate two of the poles in the three pole cluster. 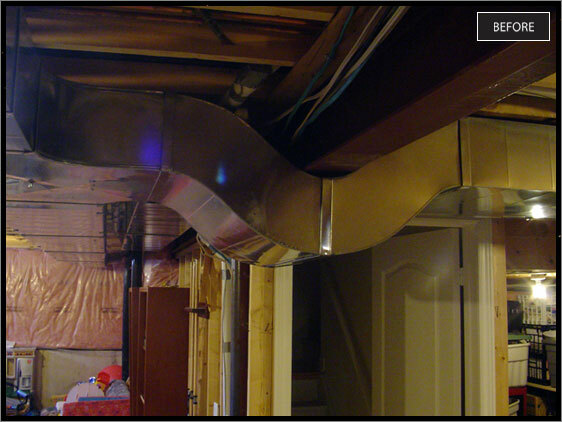 In 90% of our duct relocation procedures, the challenge is to reroute and eliminate the air duct humps which dip down underneath the I-beams while at the same time creating a more efficient path to improve air flow - especially to those second floor rooms furthest away from the furnace. Just moved in. Basement already finished. No room for pool table. 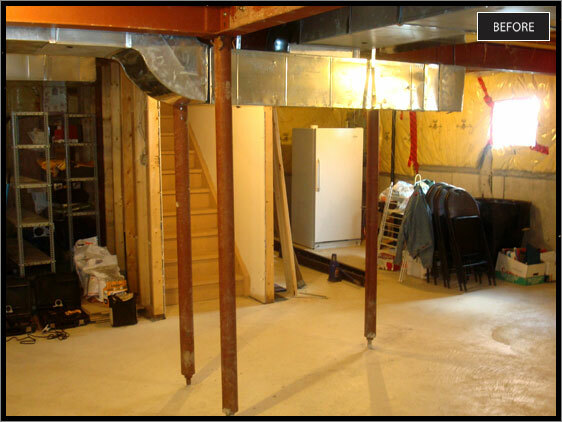 Throughout our picture gallery you will find some "before" pictures that have poles drawn in digitally as is the case here. It should be pretty obvious which ones they are. In many cases the poles go right through or are very close to where pool tables end up being placed. 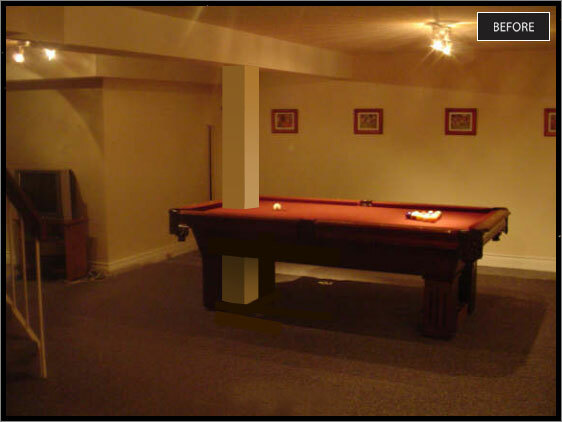 A large portion of our post/pole removal procedures are to accommodate pool tables. This home also had the additional challenge of the basement being finished so considerable care was taken not to damage or soil what appeared to be quite new carpeting. In this case the existing drywall bulkhead covering the steel I-beam was almost surgically removed to avoid any damage to the ceiling. The beam was then reinforced to accommodate the new span and the bulkhead replaced. This particular column was quite large, about 1 foot square, covering a standard 3.5" diameter steel pole. It was probably made that large to match the width of the bulkhead above and looked well done - except for its location ! Classic under-beam duct hump partially blocking door to basement ! In most cases, such as here, the rectangular supply duct is transitioned to several round ducts which are then passed over the beam between the joists and then recombined into where the duct continues. Care must be taken to maintain clearances so that the galvanized air pipes passing over the beam do not contact any dissimilar metals such as copper or steel gas and water pipes creating corrosion points. eliminate the need for additional bulkhead boxes resulting nice clean and straight ceiling lines. 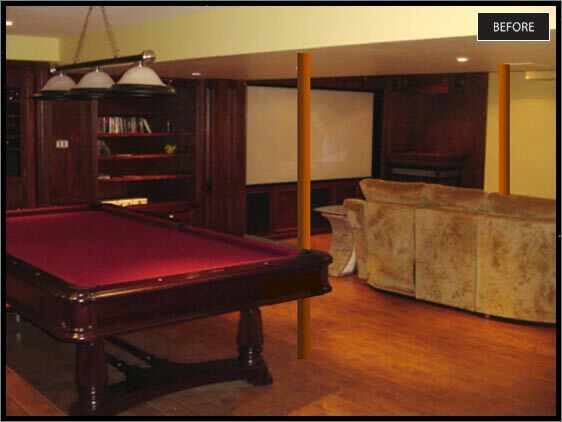 Steel poles in way of pool table and home theatre. The poles in this home's basement conflicted with the desired floor plan, one pole being about 6 inches from the side of the table, the other passing through the seating near the backrest ! These poles each supported steel I-beams running parallel to each other. One was a slightly longer span than the other but for beam reinforcement purposes they could be dealt with independently. Without the removal of these obstructions, this exceptional recreation area would not have been possible.